Often parents ask us about how they can incorporate the methods we use in the classroom to their homes. 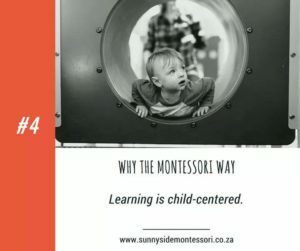 It’s wonderful for children to have consistency between Sunny Side and their home and it’s great if parents can use The Montessori methods at home therefore creating a Montessori lifestyle for their little ones. Encouraging independence, exploration, order and self-motivation are fundamentals to the Montessori approach. Children learn how to care for themselves and their environment while developing self-confidence. Creating an ordered environment and a set routine is essential for children to feel safe and secure in their environment. Teaching real-life skills to children helps them develop skills to become part of the community. Children in the Montessori environment learn to be helpful to others, clean up after themselves, prepare their own meals, tidy the shelves, dress themselves and function as independently as possible. 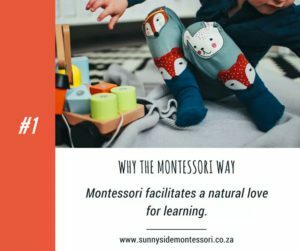 Most Montessori materials are either self-correcting or include a control of error, therefore when the child is working on the activity they can test themselves to see if they did the work correctly. This makes the motivation to successfully finish a task an internal drive to learn and not an external consequence- like getting a treat or being punished if you made a mistake. At Sunny Side we are very insistent on grace and courtesy in the classroom. We encourage good manners and treating others with respect. We remind children to use their words in all situations so they learn to express themselves. We encourage being gentle with one another and using gentle hands when dealing with equipment. Our four classroom ground rules include; walking feet, listening ears, helping hands and an inside voice. At school we give mounds of support to being positive and having our environment set out in an inspiring positive way. I feel that a positive and joyful home environment is best for children to develop in a happy and confident way. Allowing your child to concentrate is very important. At Sunny Side we avoid interruptions and allow children to finish their task in a quiet and calm environment. Interrupting a child while they’re working is unhelpful and unnecessary. We encourage you- to bring Montessori home.